Are You A Shnooper Yet? Well, if you aren’t a Shnooper yet, you should be! Hot new daily deal site. Yesterday, MarkdownMom scored the newest concealer by It Cosmetics, namely their Bye Bye Under Eye waterproof, cream concealer for about half of the price offered by a popular shopping network! Today’s Deal is 20 pairs of Faded Glory Infant Boy Sox SIZES 0-18 mos. for $10 and Free Shipping! But hurry,if you want to scoop the shnoop, remember these are timed sales. Good Morning America yesterday directed bargain hunters to where the After Christmas Bargains can be found. Expect bargains on televisions, deals will be continued up to Super Bowl Day. Best Buy and Sears have already started offering sales on tv’s, be sure to check the web before going to the stores for prices and free shipping. Sears has free delivery on television sets valued at $799 or more. Best Buy is also offering deals on smart phones and IPhone cases. Zales and Gordons. Will be having jewelry sales with up to 60% off. WalMart, Target & Lego.com. Having sales on toys. MarkdownMom was at Target on Saturday and selected toys at that time were reduced by30%. Check out selected computer sales at Walmart, too. Shopko. In store 7o% off Christmas merchandise including holiday theme pajamas and tops, holiday wrapping and decorations, and promo toys offered for the holidays, like The Series 20″ tabletop air hockey game, reg.$39.99, sale priced $10! Check on line for End of Year Closeouts. QVC. Year-End Clearance with 1 Extra Easy Pay payment—today only! Quit Monkeying Around, Only 3 Days Left To Xmas! Well, the Wednesday One Day Only Web Busters at Macy’s was too good to pass up and well, time is growing short so MarkdownMom stayed up to 12:01 A.M. last night so that she could grab a few goodies like the 1 ctw. 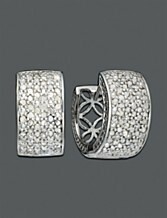 diamond hoop earrings reg. $250 for $69.99! Yes, they are only 5/8″ and it’s true that they are sterling silver and not gold, but 1 ctw., come on! However, watch out for a pricey shipping rate. 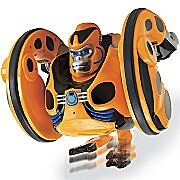 Now JCPenney has a terrific Wednesday Steal today of this gorilla robot, reg.$99 for $19.99. Further, you can have this sent to the store to save shipping. Now this little baby will require batteries, but it has more than 100 features and animations, remote control, and 2 rocket launchers! I mean two rockets! Wow-e-e!!! Just make sure that your child gets the opportunity to play with it also. Remember These Wednesday Steals are available today only! Bibs Make Baby Look Hot! In keeping with this fashion season of upgrading your wardrobe with accessories, creating layers with jewelry has been especially hot. Chunky necklaces paired with multiple chains, enhancers, have given rise to one piece that provides a lot of bling for the buck–the bib necklace ! Markdown Mom has found some deals that are bound to enhance any wardrobe in time for the holidays and the 2010. 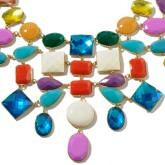 For color that will go with anything, Markdown Mom likes this bib necklace from HSN. Individual cabachon and bezel cut faceted stones in an array of eyecatching color will go well with any neckline. Brought to HSN by host Colleen Lopez, this 22″ with 3″ extender necklace is perfect to add a little glam for the holiday season. And at $69.95 with two flex pays, well within affordability. For a classic look at a rock bottom price, check out the offerings at JCPenney. 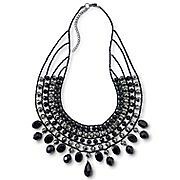 Like this 22″ w/3″ extender hermatite and black 4 rows bead necklace, reg.$30.00, sale priced at $19.99. In stores and online. Jin Yun Xian Pearl Store. Hot Pearl Site!!! Sells wholesale and retail pearls out of Beijing, China. Regular shipping takes about 24 days. For a total merchandise of $35, shipping was $15, but well worth it since the pearls are priced incredibly low. Be sure to check their irregular necklaces since these include BIWA and Coin Pearls. Necklaces may require extenders since 18 inch necklace seemed small; however, pearls were as good as pictured. Imagine buying pearl earrings for $3 to $5 a pair! Inventory includes bracelets, necklaces, earrings, rings, brooches, pendants. MDM gives site two thumbs up!